Have you been to your local garden centre lately? Grand Central at rush hour is a fair description of what awaits you there during this month when the scented lure of blooms and blossoms brings out the shrub-happy horticulturalist in all of us. Crowds jostle and aisles rattle to the clamour of trolleys pushed at full throttle toward the last stands of Black Bamboo and Foxtail Lily, and woe betide anyone caught between two hardy annual septuagenarians locked in a death struggle over specimen Argentinian vervain or Himalayan lily. The merrily ringing cash registers at every plant market bear eloquent testimony to a Bord Bia survey showing Irish consumers' gardening spend increased 22pc between 2011 and 2014 to reach a fertile furrow of €631m. Must surely be pushing close on the billion by now. In the mood for some inspiring horticulture away from the retail hysteria of the market garden wisteria wars, we pointed the jalopy toward the sunny South East last weekend and an appointment with cultivation art of an entirely higher level. The gardens at Mount Congreve, just outside Kilmeaden in Co Waterford, glory in 70 acres of intensively planted woodland, including 3,000 trees and shrubs, more than 2,000 rhododendrons, 600 camellias, 500 conifers, 300 acer cultivars and 1,500 assorted herbaceous plants from every continent. I didn't spot any partridge in a pear tree, but there was surely one in there somewhere. Having inherited the demesne in 1963, Ambrose Congreve devoted much of his life to the gardens, and died at the ripe old age of 104 while attending, appropriately enough, the Chelsea Flower Show. 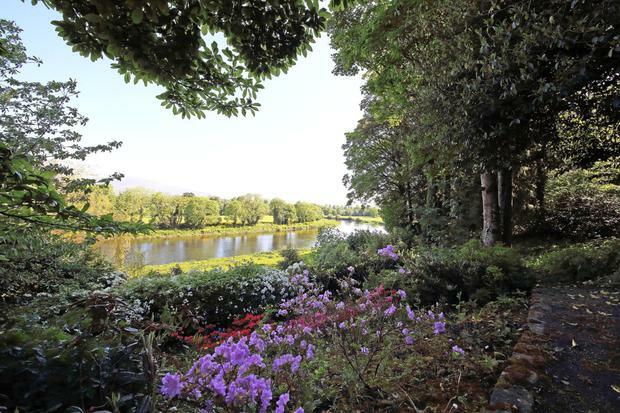 Walking the 25km of paths, rockeries and trails along that magnificent site on the banks of the River Suir, it was hard not to conjure the fantasy of what great wealth and love can achieve when brought to bear upon rich and yielding soil. On his 100th birthday in 2007, the sprightly Ambrose planted a Wollemi Pine - a species dating back 200 million years. At his centenary lunch, the man who roamed the world for planting treasures quoted that ancient proverb much beloved of all who delight in dirt beneath their nails: "To be happy for an hour, drink a glass of wine. To be happy for a day, open a book. To be happy for a week, take a wife. To be happy for ever, make a garden." Cruising homewards, accompanied by a dusky sunset and dozens of iPhone images, thoughts of those bygone 'Big House' days and their attendant landed gentry flitted through the brainpan as we chewed up the miles across Ireland's finest land. The 2013 documentary 'The Raj in the Rain' sprang vividly to mind with its eccentric portrait of the Anglo-Irish ascendancy and their lives of languid lassitude in mansions often dwindling towards decrepitude. "Part of the problem with ancestors was they didn't have quite enough to do," explained Sir Josslyn Gore-Booth of Lissadell House. "It was like entering a Kafka novel where they all just sat around talking about the end of the world, but not inclined to do anything about it." One vivid exception was the colourful Molly Cusack Smith, chatelaine of Tuam's Bermingham House and the first woman master of the Galway Blazers. An awestruck New York reporter once interviewed her after a long day's hunting. "But ma'am, should we be concerned that your horse is foaming at the mouth?" he babbled. Hauling herself up to her full imperious height in the saddle, she fixed the Yank with a steely eye and retorted: "So might you, young man, were you between my thighs for the past four hours!" Ah yes, they just don't make 'em like that anymore.